really? u.s interiors instagram feed? If there is one Instagram feed you should be following, it’s the US Department of the Interior. We know—what?? But trust us, it’s not a bunch of photos of park signs and public amenities. According to the department’s website (http://www.doi.gov/index.cfm), the mission of this division is to, “protect America’s natural resources and heritage, honors our cultures and tribal communities, and supplies the energy to power our future.” So then, what is the purpose of the Instagram feed? So, if you have a little spare time today, and want to see some amazing photos, check out the site. The photos are stunning. Really. From sea to shining sea. 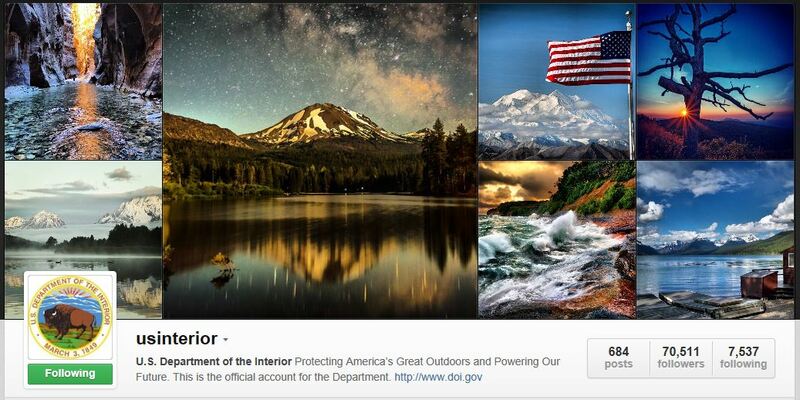 Tags: America, creative, Instagram, photography, photos, U.S. Department of the Interior. Bookmark the permalink.